Fernando Jimon Melchor represents more than five generations of traditional ceramics from Tonala, Mexico. His work is noted for a modern flair that still adheres to the traditions of his famous family. Born in 1971, Fernando says he first became interested in pottery at the young age of seven, and became active in pottery making at the age of nine. He participated in his first competitions on both a local and international level at only thirteen years of age, and after receiving such a high level of reception, he decided to dedicate himself to the art of pottery. Fernando went on to win more national awards than we can even mention! His work is full of fine and minute detail, expertly crafted to the highest level of precision. As a recognized master artisan, he was invited to join Herencia Milenaria de Tonala in 2006, the association promoting the work of the ancient heritage of Tonala, Mexico in the new millennium. He served as president of this organization, one of the most prestigious group of artists in Mexico, from 2009 to 2012. Fernando continues to win award after award on a national level in Mexico for his incredible detailed and beautiful work. He works in the style known as Barro Brunido or Barro Bandera, roughly translating as Burnished (or highly polished pottery achieved through hand polishing) and banded design pottery. Fernando Jimon is who we would warmly consider as one of the great voices of today's folk art in Mexico. His pieces are the ones that, out of your whole collection, you will treasure in the future. 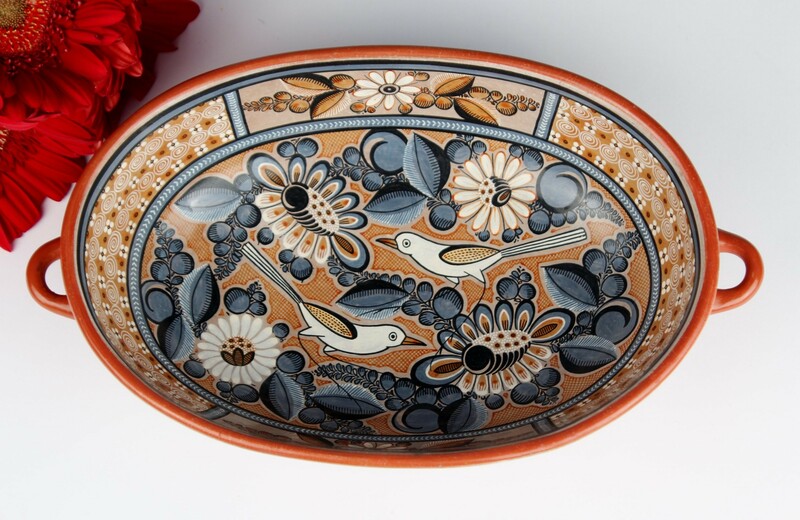 They are hard to come by, and true representative of fine quality Mexican Folk Art! Grab it while you can! These are not pieces that you will see everywhere you turn! One of a kind and truly museum quality artistry!